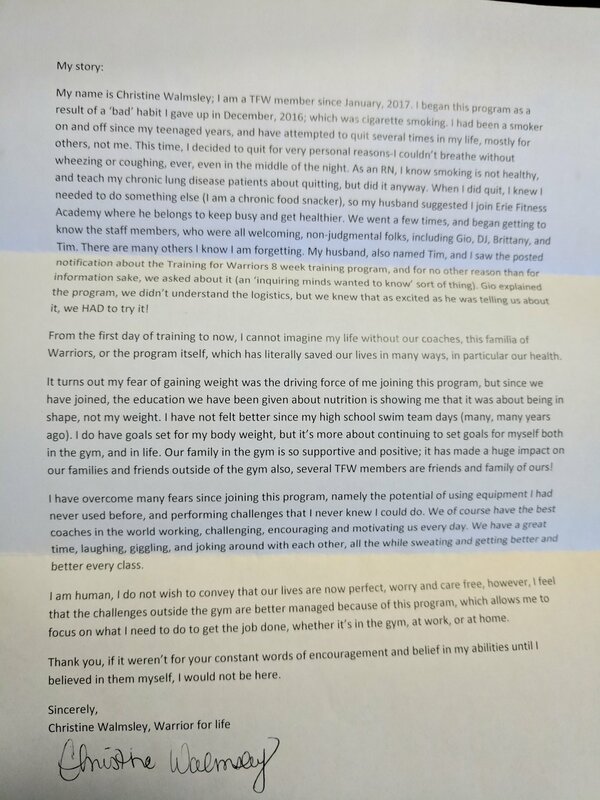 "From the first day of training to now, i cannot imagine my life without our coaches, this familia of warriors, or the program itself, which has literally saved our lives in many ways...i have overcome many fears since joining this program, namely the potential of using the equipment i had never used before, and performing challenges that i never knew i could do. we of course have the best coaches in the world working, challenging, encouraging and motivating us every day. we have a great time, laughing, giggling, and joking around with each other, all while sweating and getting better and better every class." "Rewarded behaviors are repeated behaviors! i have learned this in so many ways over the past year and a half. My daughters struggles really had me searching for something. something to make me stronger - better - not only for her but for me! So i joined this program (TFW) that was a great fir for me and my endeavors to better myself and my family's."